Jan. 25 (NBD) – Though the sales of new energy vehicles (NEV) exceeded the landmark of 1 million in China in 2018, the niche market of new energy bus has seen a declining year. Reduction of subsidies and the relatively limited market both contributed to the unsatisfactory performance in the sector last year, said Cui Dongshu, secretary general of the China Passenger Car Association, to news outlet Yicai. Data from industry website ChinaBus.Info shows that about 91,000 new energy buses longer than 6 meters were sold last year, a 2.3 percent year-on-year decrease. Among the top ten new energy bus manufacturers only four saw growth. Of the four, Zhengzhou Yutong Bus Co Ltd (Yutong Bus, 600066.SH), BYD Co Ltd (002594.SZ) and Zhuhai Yinlong New Energy Ltd are the top three players. With strong governmental promotion, public transportation nationwide has seen large-scale replacement of fossil fuel buses with new energy ones in recent years. Meanwhile the high level of subsidies stimulated the fast expansion of new energy bus market. To illustrate, an electric bus between 6 meters to 8 meters in length could get subsidies as high as 600,000 yuan (88,438.2 U.S. dollars) from central and local governments before 2016. Thus a number of listed bus manufacturers heavily relied on governmental subsidies. Yutong Bus, the top one manufacturer in terms of market share, earned 4.05 billion yuan (597.0 million U.S.dollars) in profit in 2016, while at the same period received 9.95 billion yuan (1.5 billion U.S. dollars) of subsidy for the promotion of NEV. When that subsidy decreased to 5.34 billion yuan (787.1 million U.S. dollars) in 2017, Yutong's profit dived to 3.13 billion yuan (461.4 million U.S. dollars )accordingly. Another factor is the 20,000 kilometers mileage requirement in subsidy policy, which dictated that part of the subsidy is given when certain NEVs including buses got license plates, while the rest of it would be given when the mileage reached 20,000 kilometers. It usually takes more than a quarter for a new energy bus to reach that number, which puts stress on the cash flow of bus manufacturers. The market size for new energy bus is limited, which is a bit over 100,000 units a year and that puts a ceiling for the sector's expansion, said Cui Dongshu. But he predicted the implementation of a nationwide three-year action plan to address air pollution might give new energy buses a boost in 2019. Fan Wentang, vice president of Nanjing King Long Bus Manufacturing Co Ltd (Nanjing King Long), still sees a wide market for new energy buses. Taking Beijing as an example, there are over 280,000 conventional buses and more than half of them are still waiting to be replaced. In comparision,the room for growth in third and fourth-tier cities is even larger, as these cities still need several years to reach electrification of buses, Fan added. The reduction of subsidy and limited market is taking effect on the new energy bus industry. Cui Dongshu told Yicai some smaller manufacturers have quited the sector and turned to specialty vehicles and modified cars. Nanjing King Long chose to diversify its businesses like manufacturing batteries. It also made foray into the passenger car sector in 2017. 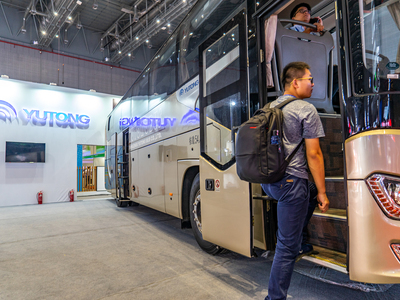 The turn to passenger cars is a result of the limited market for buses, said Cui Dongshu, but it also means the target customers changed from government to private consumers, who demand low-cost and efficient products, and that poses major challenges to bus manufacturers.